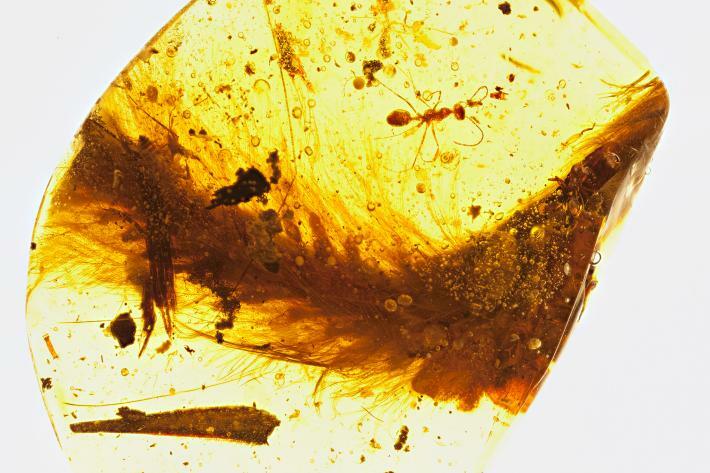 The scientist found a 99 million year old dinosaur feather. This feather includes bones, soft tissue and even feathers. 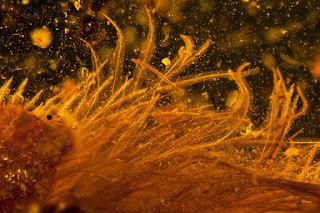 This feather is found and preserved in Amber. Already the evidence for feathered dinosaur have been found in fossil impressions in Amber. But this is the first time that they found a clear well-preserved feather. This helps the scientist to know more about the evolution and structure of the dinosaur feathers. The paleontologist Lida Xing of China University of Geo-science led this research. This research was funded by National Geographic Society's Expeditions Council. It is a semi-translucent mid-Cretaceous sample. The hard shapeless piece of resin is in the size of a dry Apricot which tells the difference between a birds feather and a dinosaurs feather. The delicate feather is appended by lump of resin of 1.4 inch size. It looks like a brown chestnut with white or pale bottom. The result of the CT scan reveals that it is a eight vertebrae from the middle or end of a long thin tail. The tail is organically made up of more than 24 vertebrae. From the analysis of the tail the researchers believe that it belongs to juvenile coelurosaur, which is a part of theropod dinosaurs that includes everything from tyrannosaurs. The same research team revealed a report in June saying that the wings of Cretaceous-era bird preserved in Amber is similar to the wings of present modern birds. Xing believes the conflicts between the Myanmar government and the Kachin Independence Army, which controls the Hukawng Valley is nearing end. This help the researchers to increase the scientific access to the Amber mines which leads to spectacular discoveries. "Maybe we can find a complete dinosaur," Xing said.